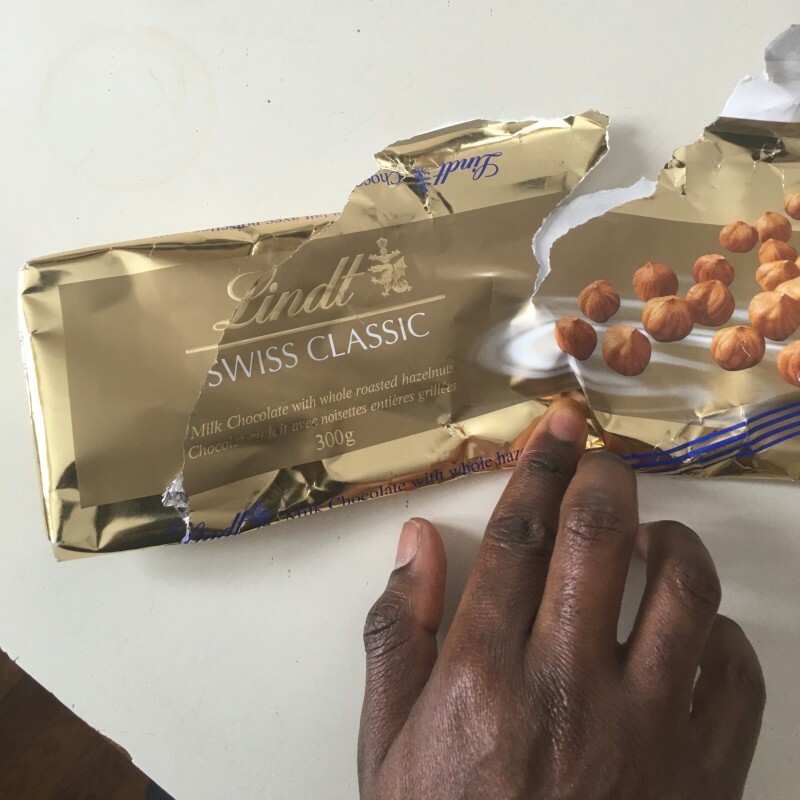 Week 6 was an equally uneventful week as Week 5 as there was almost seven days of heavy snowfall in the regions so I stayed indoors and was just working on music and travel logistics. I also put that “dead time” to good use by eating properly and sleeping since these are very essential to good rides. 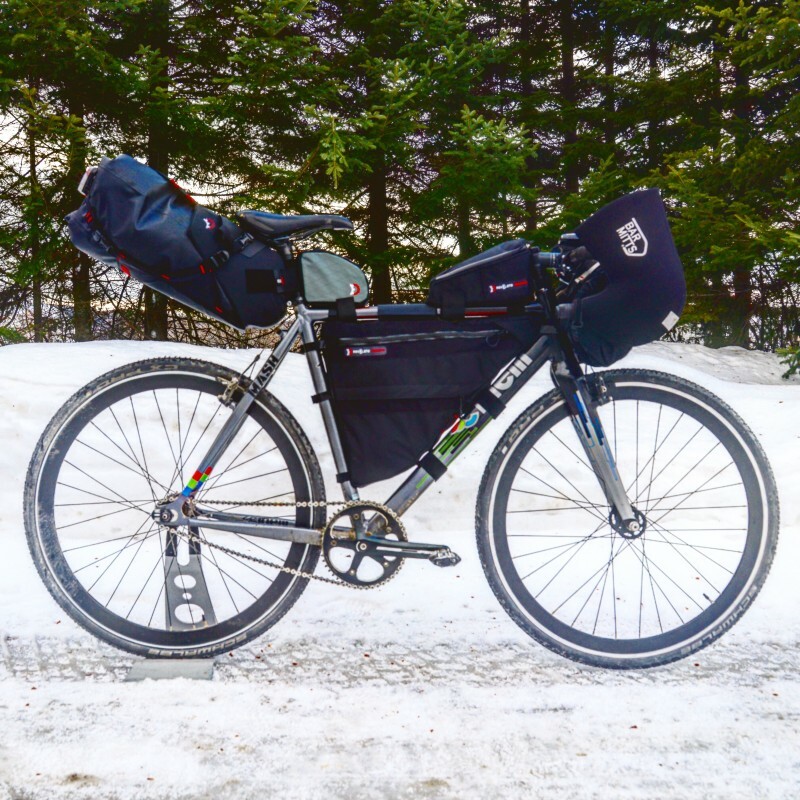 While waiting for the weather to clear, I also ordered bicycle bags to carry my belongings since I wanted to be independent and need to depend on my support vehicle with all my luggage. Below is what the bicycle looked like fully loaded. I probably have an extra 15 kg on it and as I will tell you later, it really did affect everything about The Big Journey! 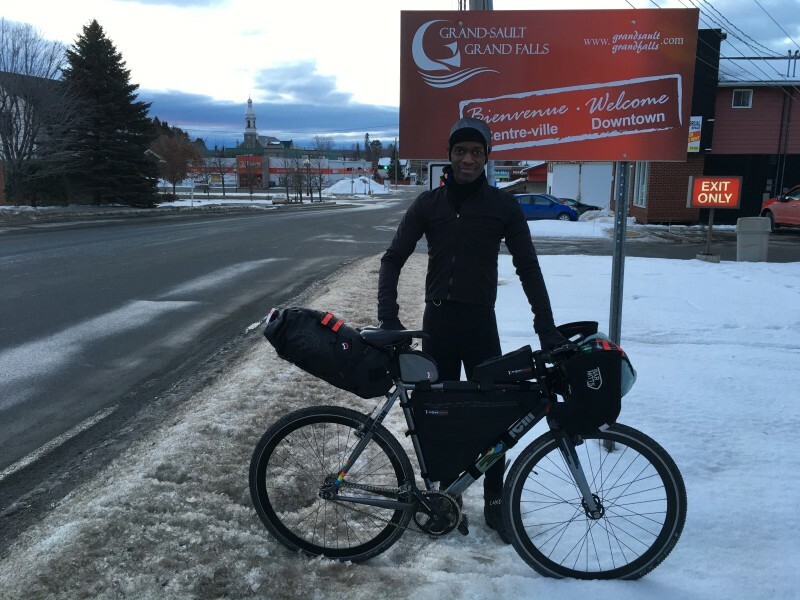 By Sunday, the weather had calmed down or so I thought so in Grand Falls (Grand Sault in French) I got back on my bicycle on my way to Fredericton. Here I am looking all futuristic and stuff without knowing that I was about to suffer like never before. At first the ride was smooth and the bicycle was surprisingly light given the fact that I had way more weight on it than usual. I was pedalling along all happy and impressed with myself at how fast I had the ability to adapt to riding such a heavy two-wheeled, human-powered vehicle. BAM!!!! I almost got blown by the wind! What was going on is very simple. I had the wind on my back and it was pushing me along and that is why the ride seemed sooo easy! 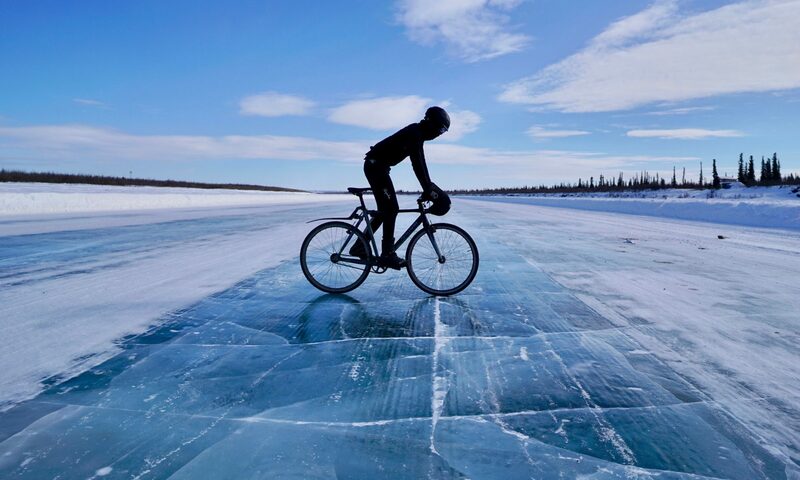 The wind was so strong that whenever I stopped, I had to lay low as I feared that it would blow me into the river. We are talking about 45 km/h winds with gusts of up to 70 km/h. I got back on the bicycle and kept on pedalling while praying that the wind stayed at my back as otherwise I would be in deep trouble. 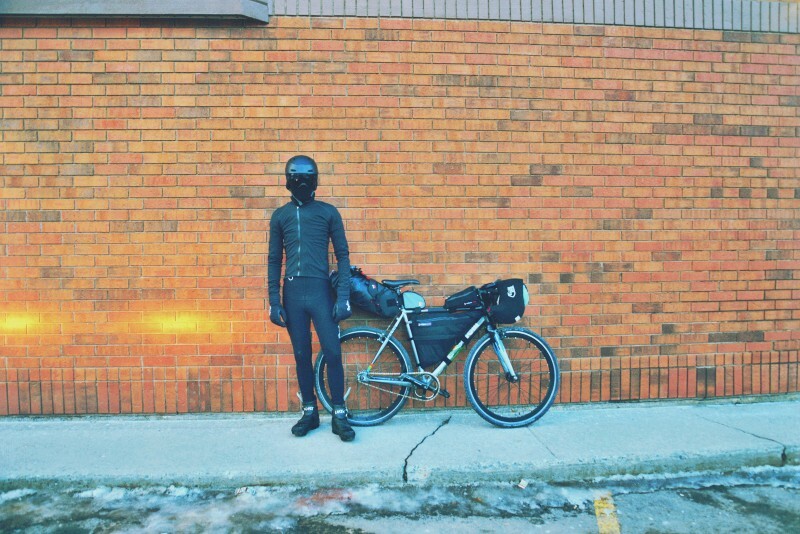 Did I even mention that I was trying to ride 200 km, the longest distance that I attempted so far on The Big Journey? So I had extra weight, crazy wind and I was aiming for an impossible long ride. 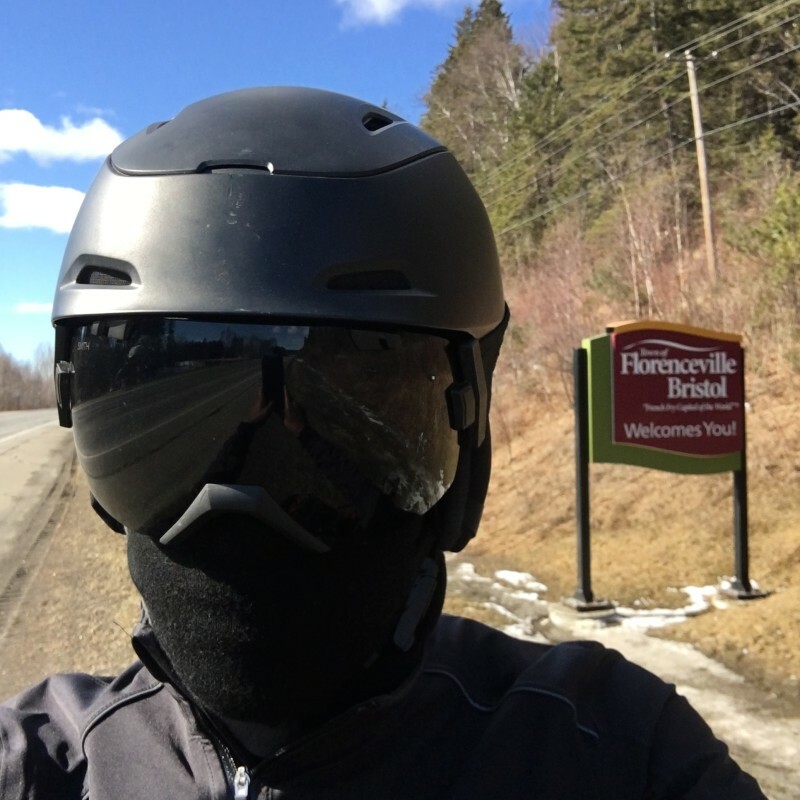 Naturally I was covered from head to toe as it was a freezing day and in such conditions, no part of my body is exposed to the elements as it could get bitten to pieces. 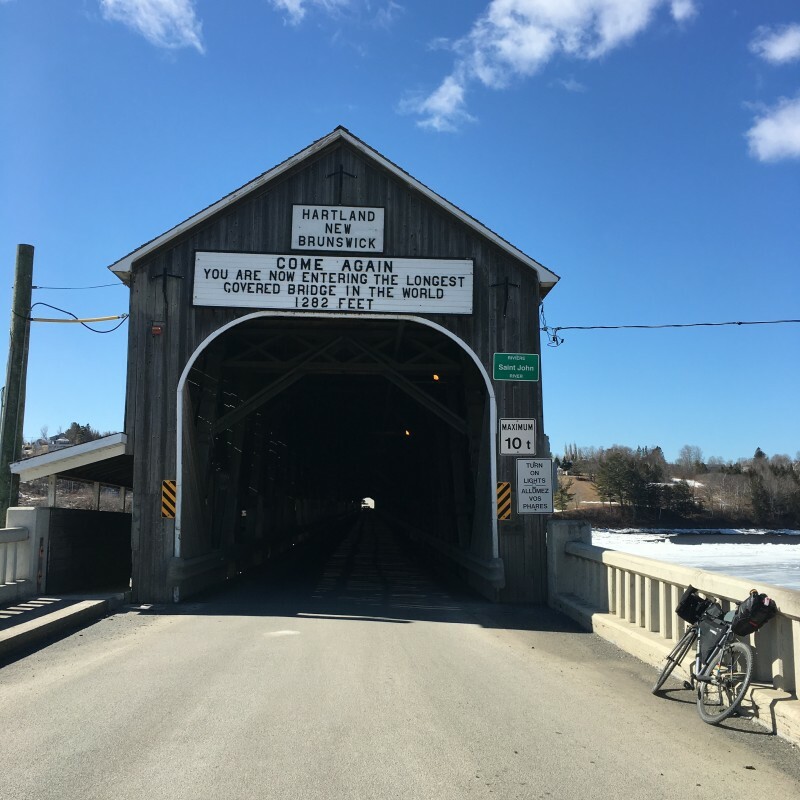 The most important landmark on my Grand Falls- Fredericton ride was the world’s longest covered bridge. I tried to cross it but the wind was so strong that I did not even bother. 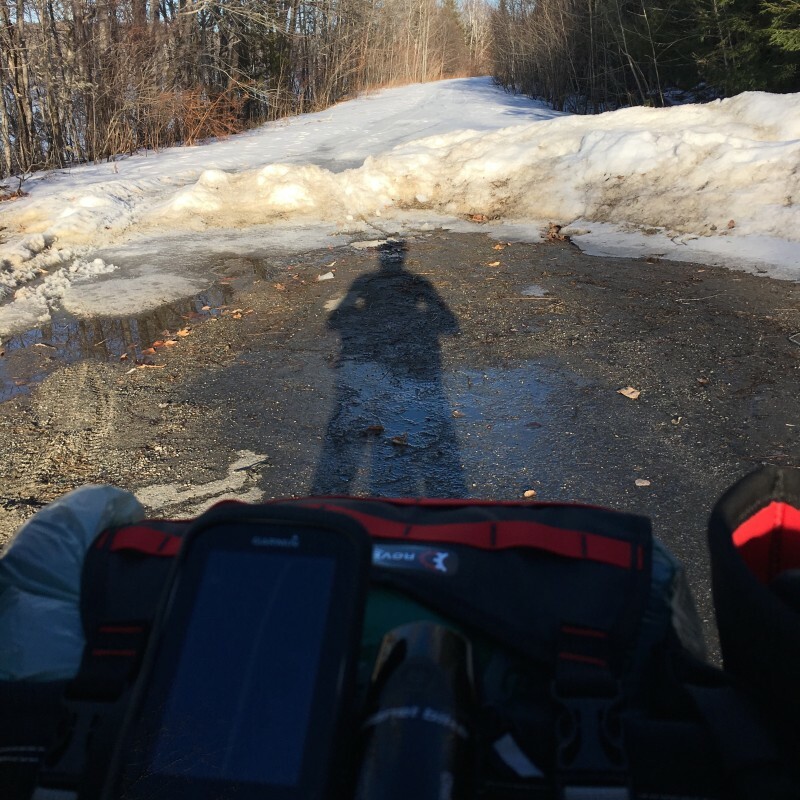 And to make matters worse, one road turned into a snow trail (in Summer it would be a gravel trail) and I had to dismount and walk for a good hour in deep snow. 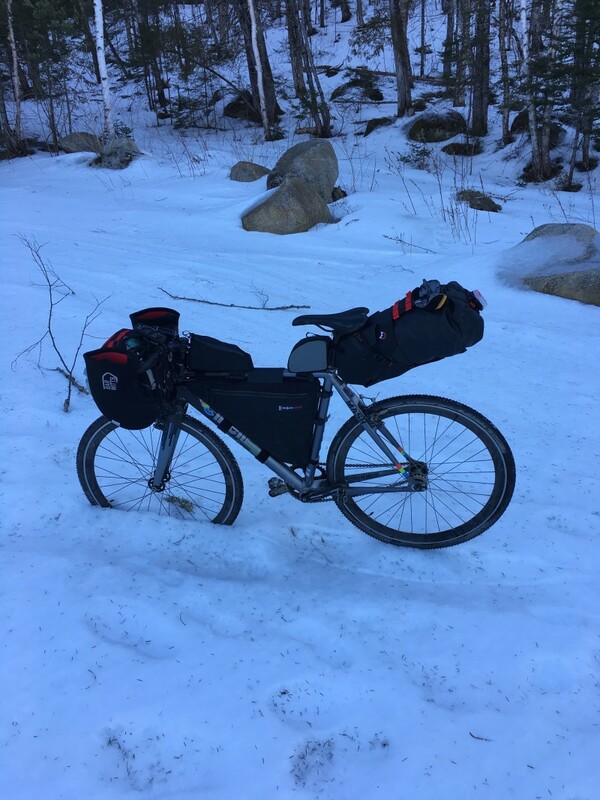 I tried to pedal but eventually the trail went to ice (which I could cycle) to soft snow and my tires got stuck to the extent that the bike could stand on its own that’s how deep in the snow it was! The fact that my bicycle was heavy and that I had been riding for over 8 hours did not help. I was just exhausted. 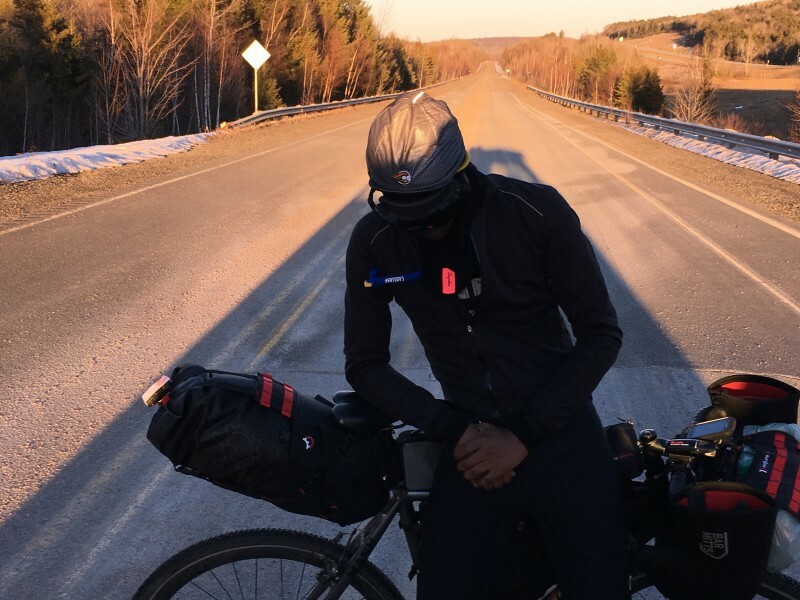 Luckily for me, my host in Fredericton got concerned and realised that I was not showing sign of life and offered to come and pick me up. 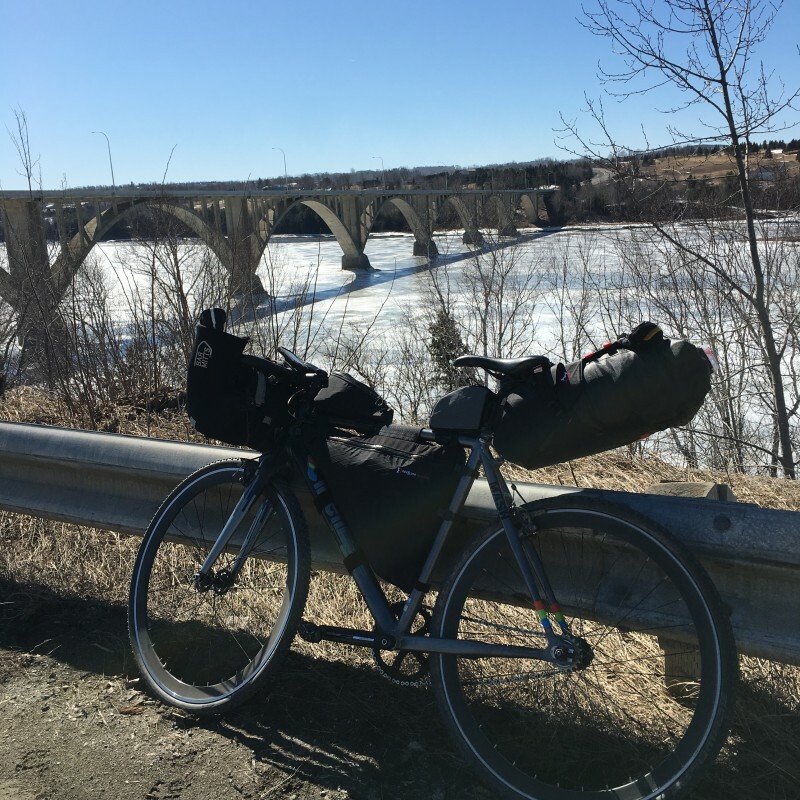 For the first time on The Big Journey, I dropped out of a ride because I was too exhausted and there is no way I was going to make it my destination. I felt like a loser but like I will explain in the next update, quitting that day was a blessing in disguise so make sure to read about Week 7. In a small community called Pokiok, I sat down exhausted and defeated and was out breath, motivation, strength and everything that one can think of. 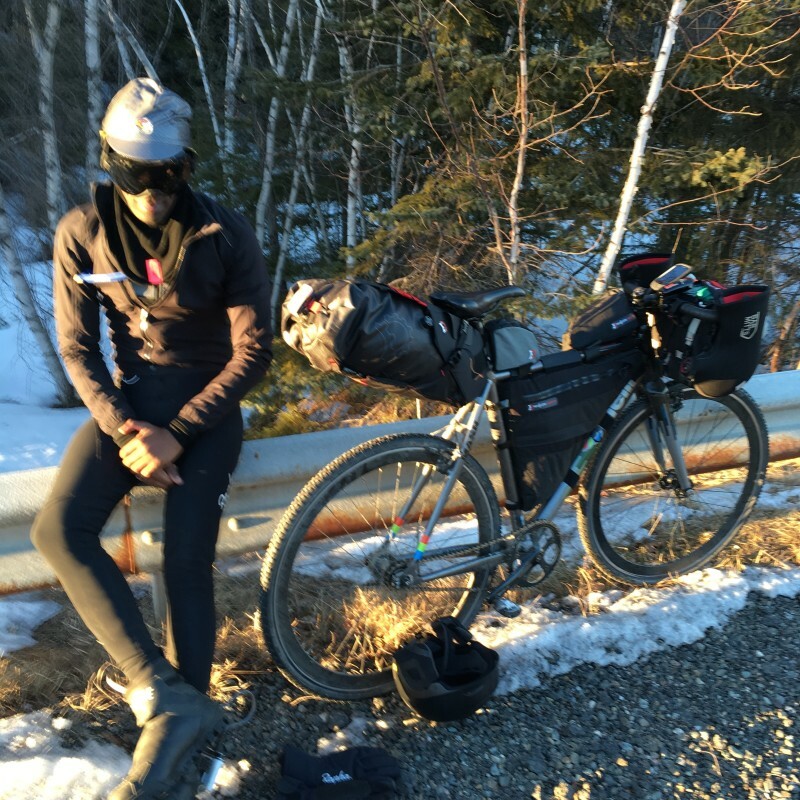 I held my head down in shame although deep down I knew that I had been way too ambitious to try and ride the longest distance ever 200 km (my average ride is 100 km so I attempted double that) on a very windy day and with a lot of new weight that I was not used to. 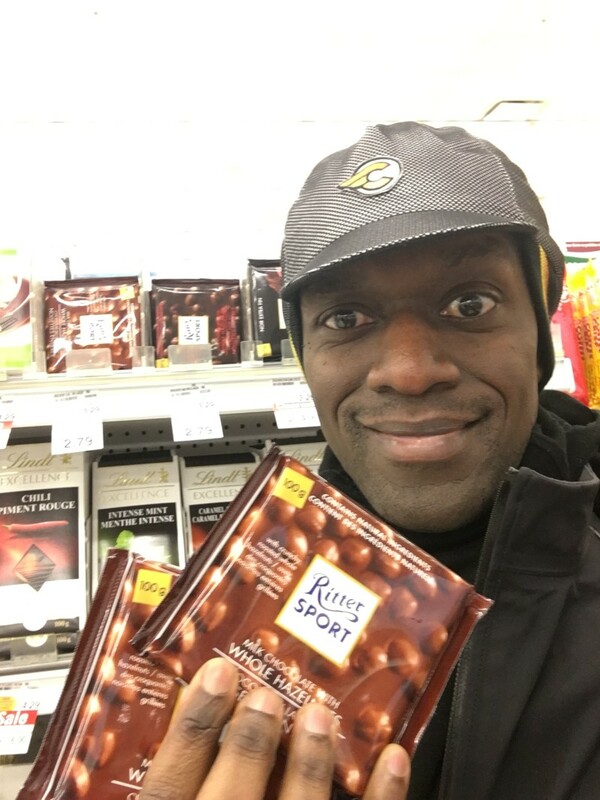 In the van on the way to my host’s home, I kindly asked him if we could stop by a supermarket so that I could get myself my favourite brand of chocolate since in victory I celebrate with chocolate and in defeat I get over my shortcomings with chocolate. When I looked at my travel log, that night, something important caught my attention. Even if I had quit that ride that day, I still had travelled 156km which is the second-longest distance that I have cycled on The Big Journey (the longest was only 160km). Yes, I was aiming for 200 km and stopped at 156km but that alone is not bad if I put ego aside for a quick second! And that was the end of Week 6, a very uneventful six days with a soul-stressing seventh day!